What IS IT with people hanging around lifts? Continuing a series looking at print ads for tertiary institutions; today, Edith Cowan University. 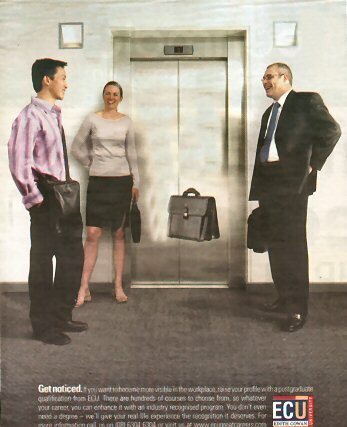 Oh dear, oh dear, oh dear… another tertiary education ad featuring people and lifts. Very aspirational, I’m sure. It may not be immediately clear to you what a floating briefcase has to do with your imminent postgraduate degree at Edith Cowan University; you must have only done a Bachelor’s degree. The text in the ad is so bland as to be meaningless: “raise your profile with a postgraduate qualification”, “hundreds of courses to choose from”. You would hope that the image in an ad supported its text message; ‘fraid not. What was the brief for this ad? Show graduates that if they do another degree their life at work will suddenly become much more casual and relaxed? That’s an insult to their intelligence.